One day, I was particularly in the mood for corn dogs as I roamed the crowded aisles of my local Trader Joe's, when I spotted these frozen puppies. I didn't see any other varieties nearby, and I was crestfallen upon noticing the "meatless" seal on the cover of this box. I wanted meatful corn dogs. Who ever heard of a vegetarian corn dog? Well, my friends, I was brave that fateful day (not to mention really desperate for a corn dog) and I went ahead and bought these corn dogs, devoid of life-sustaining meat. And wouldn't you know it, but the evil genius that decided it was a good idea to make vegetarian corn dogs also decided it would be a good idea to make them taste good. Now, I'm not going to lie to you -- if I had a meaty corn dog in one hand and these Trader Joe's Meatless Corn Dogs in the other, I could probably tell which was which. But, without having the meatful corn dog for reference, the average consumer probably wouldn't detect the absence of meat in these amazing TJ's Corn Dogs. I really like them. Easy to microwave, relatively healthy; look there, "4g of Soy Protein." I've got to hand it to these vegetarians; not liking the taste of veggie foods is an increasingly invalid excuse for eating meat with every meal. 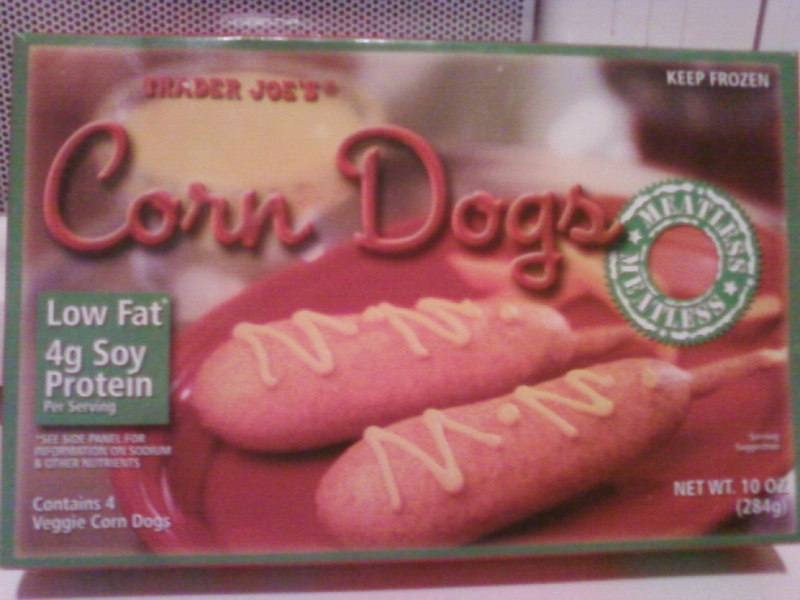 Trader Joe's Meatless Corn Dogs are healthy and tasty, and you can enjoy them without wondering if there are pig snouts or hooves in the food. Always a plus. Agree- these are fantastic. 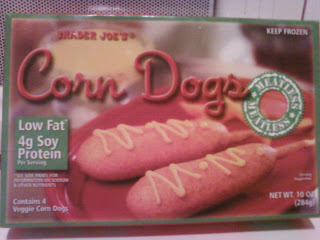 I have tried three different vegetarian corn dog brands and these, by far (leaps and bounds) are the best.